If a new car isn’t your thing and you want to buy used, always get your own car history check. There are free data reports available including CarVeto’s free service. Enter a car reg for an instant, online report. The Dacia Sandero remains Britain’s cheapest car and is on a par with the cost of a used one. Available as a five-door hatchback only, it offers a range of engine sizes and trims to choose from. It has soft suspension and copes well with bumps and potholes. The engine is a little noisy, which the cabin does not muffle at high speeds. 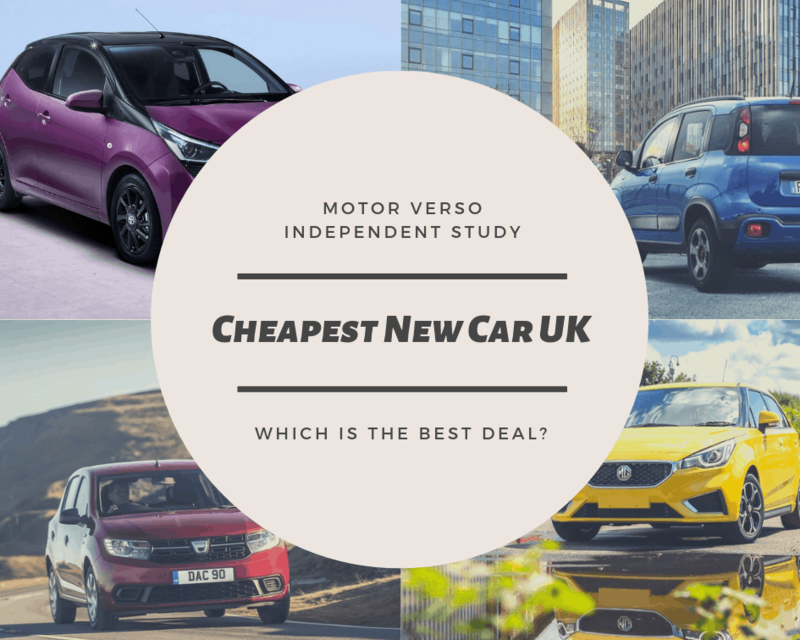 The Suzuki Celerio is second place on this cheapest new car UK 2019 list. 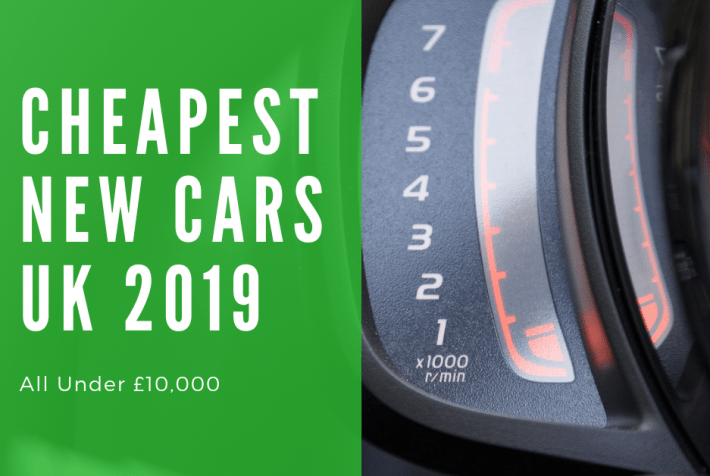 New car discounts will take the price down by a few hundred pounds also, but keep an eye on the used market, where two-year-old Celerios start at just £5,000. The Dacia Logan MCV trumps its cousin the Sandero in the value for money stakes. If space is a priority for you, then look no further! With the back seats up, the Dacia Logan MCV has a 573-litre boot that rivals that of a large estate car. Don’t forget, you can also fold the seats down, so the capacity more than doubles and the low boot opening makes loading a doddle. But in entry-level Access trim, you have wind-up windows and no radio. You might find yourself wanting a bit more. It shares its sparsely equipped interior with the Sandero, so the £9,295 Logan MCV Essential is the best choice, as it offers a digital radio, remote central locking, front electric windows, a car alarm, tyre pressure monitoring plus a whole lot more. 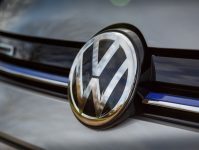 Skoda is owned by the Volkswagen Group and the Citigo is similar to their up! model. It is the perfect city runabout and is also capable of motorway driving. The engine bay has been cleverly designed to enclose the engine in a small area, leaving plenty of leg room for four adults to sit relatively comfortably. There is also a generous boot capacity of 251 litres that jumps to 951 litres, when you put the rear seats down. This stylish five-door hatchback is available at an extremely low price but does not feel like a budget option. The Hyundai i10 can accommodate four adults and it’s stable at higher speeds, especially on the motorway. 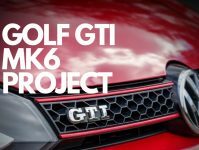 It has an efficient 1.o-litre engine that has 67 PS, with a fast throttle response, helping to make this car feel alive. The suspension can easily negotiate potholes, making for a settled ride and the steering is light, so parking is no problem. The tall windscreen gives an unobstructed view of the road ahead but there is no seat height adjustment (unless you upgrade from S to SE). There is ample boot space of 252-litres for your shopping trips and plenty of head and leg room inside the car, considering its footprint on the road. Both the Citroen C1 and Peugeot 108 are very similar cars made in the same factory in the Czech Republic. But they each have their own look and charm, so the choice is down to your individual tastes. The MG3 could give you the best driving pleasure out of the cheap city cars. 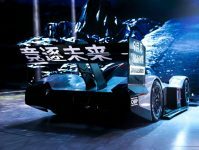 It features a much larger 1.5-litre petrol engine that creates 106 PS, accelerates from 0-60MPH in 10.4 seconds, returning around 47 MPG on a combined cycle. So, there is plenty of enjoyment to be had in this vehicle for the low price. The Peugeot 108 in entry-level trim Access, is similar to the Citroen C1, you get the 1.0-litre three cylinder petrol engine that creates 72 PS and can achieve 58.9 MPG on a combined cycle. The Fiat Panda is a cheap, practical vehicle and is a good alternative to more conventional city cars like the Volkswagen up! and the Hyundai i10. It is well suited to urban driving as it easily absorbs bumps and ruts. The raised driving position will give you a good view of the road. However, it can feel unsettled at higher speeds with noticeable wind noise at times. As with most of these cars the Volkswagen up! also shares its components with other city cars, such as the Skoda Citigo and the Seat Mii (Mii costs from £11,690). The good news is that it gains the generous space, pleasant ride and solid feel of the other two models and has low running costs. Being very similar to the Hyundai i10, the Kia Picanto has a lot to bring to the party. The most affordable trim level is simply called ‘1’. It offers the basic requirements, such as front electric windows, remote central locking, radio with USB and aux-in, hill assist support, an electronic stability system and even automatic headlights. Powering the Picanto, in line with the competition, is a 1.0-litre 66PS engine that will get from 0-60mph in 13.8 seconds and can achieve 56.5 MPG on a combined run. So, the car is one of the fastest of the bunch. Most importantly, Kia offers a solid 7 year, 100,000-mile warranty which beats the competition and really brings down the cost of ownership over time.